This puzzle was a gift from a friend, and I was pleasantly surprised by how much I enjoyed this puzzle. I have done Hennessy puzzles before and expected the random cut pieces. I appreciated how thickly solid the pieces feel, and the box indicates that it is made of “Superior Quality Blue Chipboard”. There was minimal puzzle dust, and the pieces were well cut, with only one set of pieces that I needed to separate. When I first opened the box, I was slightly intimidated by all of the blue ocean pieces, but this puzzle was great to assemble once I planned my strategy. I began by assembling the border pieces and then moved on to Antarctica, followed by the small insets showing the world from the South and North Poles. 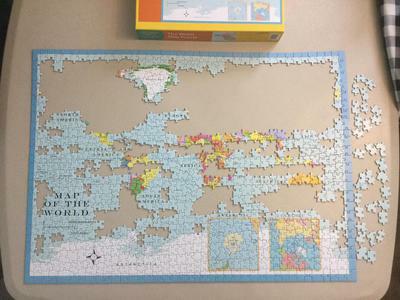 Next, I tackled the bold black names of the puzzle and the continents before assembling the blue names of the Equator, Tropics of Cancer and Capricorn, oceans, and seas. Next, I chose to work from side-to-side, completing the thick blue line of the Equator and the dotted blue lines of both Tropics. I sorted out the pieces for Polynesia on the far left side and Micronesia and Melanesia on the far right side. The Western Hemisphere was calling my name, and I quickly assembled South, Central and North America. Africa was next, then Europe, and Asia. I tackled the remaining ocean pieces by placing any with traces of color or letters on them, then any with latitude or longitude lines, and finished up with the solid blue pieces. This puzzle took me approximately 6.5-7 hours, which is normal for a 1000 piece puzzle for me. I am an experienced puzzler, so don’t feel that you need to do it that quickly. I mention my time only to point out that it was not frustratingly challenging. This puzzle might possibly be too much for very young puzzlers, but older kids, adults and teams of puzzlers will enjoy spending time with this puzzle. The text ran the gamut from bold, large letters that were easy to see and assemble, and very small writing that some might need a magnifying glass to read, although I had no problem reading the smaller print. 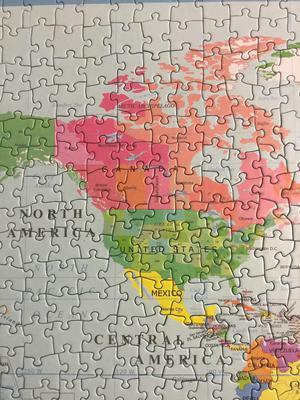 One of my favorite classes in school was geography, and I enjoyed testing myself when I was working on this puzzle. I seldom had to use the image on the box top, with the exception of some lesser known seas that I was unfamiliar with. There is a poster included, but I appreciate the fact that the box image was exact and not covered by any marketing images, as some companies use. 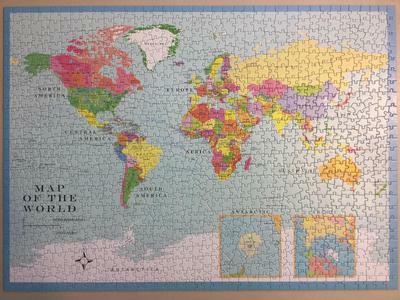 I would recommend this puzzle for anyone, especially those who enjoys map puzzles, geography, or random cut pieces. 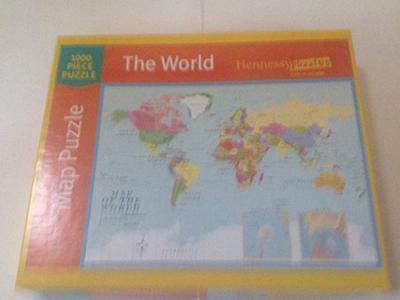 Hennessy Puzzles is a company with the heart of a puzzler, and they back their products. They also offer a free “memory magnet” of this puzzle, which is something that I have never seen before. Overall, I am rating this puzzle a high 4.75 out of 5 stars, and think that you will enjoy it, too. Thanks very much for your review Sherri. This is a really attractive traditional map. Many puzzzlers enjoy maps and your comments sharing your strategy will be most helpful to those who may be intimidated by ALL that blue! 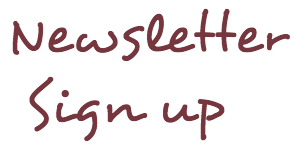 Join in and write your own page! It's easy to do. How? Simply click here to return to Submit Puzzler's Reviews.